I have a confession. I had to give away half these Watergate Cupcakes to a friend because I had zero willpower when it came to these gorgeous treats. While I normally love a rich, chocolate, fudgy cupcake topped with a buttercream frosting, these Watergate Cupcakes are the exact opposite. Which makes them irresistible. 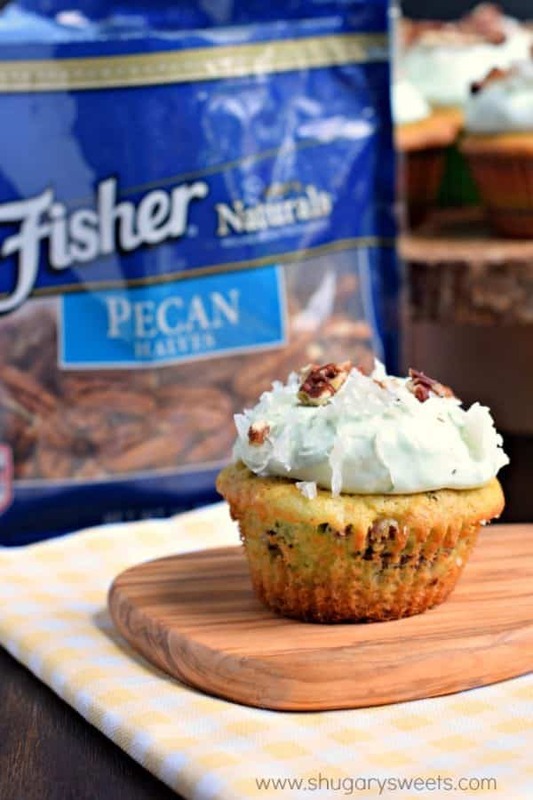 The soft pistachio pecan cupcake has the perfect crumb texture. 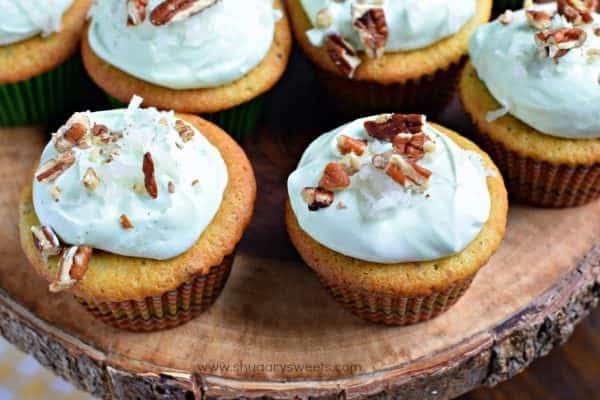 And then I frosted these with a pistachio pudding and Cool Whip frosting, with MORE pecans and a sprinkle of coconut. Seriously, even my coconut hating kids loved these! Regardless of how it got it’s name, these cupcakes are amazing. Nutty, moist, packed with pecans, you’ll seriously fall in love. One difference though than your typical watergate salad is I didn’t use any pineapple in this recipe. I really wanted to the pistachio and pecans to take the front cover here! And the frosting, so light and fluffy, is perfect when you add a sprinkle of pecans and chewy coconut. Even toasted coconut would be fantastic on top if you prefer the texture of that instead! It’s the perfect summer cupcake! 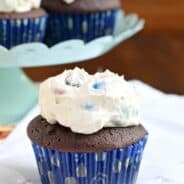 4th of July is right around the corner and I think showing up with a tray of these cupcakes is the best thing you can do! I think you’re going to LOVE this recipe! You all know I love Fisher Nuts. I love that they are preservative free, and the deep nutty flavor in every bite is truly wonderful. YOU all are going to love that because of my relationship with Fisher Nuts, you’re going to get an opportunity to win a great big basket of awesomeness. 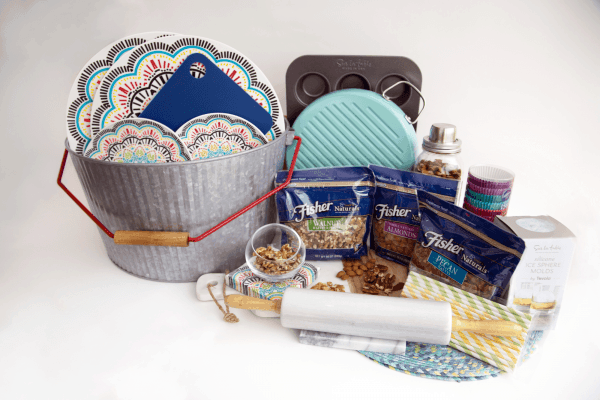 Enter the Summer Entertaining giveaway below featuring over $450 worth of entertaining items from Crate & Barrel and Sur La Table. You’ll have some great baking essentials, perfect for whipping up a batch of these Watergate Cupcakes at your next bbq or potluck! You're going to LOVE these Watergate Cupcakes! Extremely nutty and moist thanks to pistachio pudding and pecans. Topped with a sweet, light whipped frosting, which is perfect for summer! Preheat oven to 350°F. Line muffin pan with paper muffin liners. Set aside. In a large mixing bowl at medium speed, combine cake mix, oil, pudding mix, soda, and eggs. Beat for several minutes until light and fluffy. Fold in chopped pecans. Using a large metal scoop (about 1/4 cup) fill muffin liners about 2/3 full. Bake in oven for 20 minutes, until lightly browned on top. Remove and cool completely before adding frosting. For the frosting, combined pudding mix with 1 cup milk. Whisk until blended. Fold in thawed whipped topping. Refrigerate for 15 minutes, or more (you can do this while cupcakes are baking and cooling). Use a large spoon (or a 2 TBSP metal cookie scoop) to dollop the frosting onto each cooled cupcake. Sprinkle with chopped pecans and coconut. Store in refrigerator for up to 3 days. ENJOY! You know that I’m a DC girl, right? I just drove by the Watergate yesterday! So you can imagine that I am totally making these for my next party. I can’t wait to explain the name! And I’ll give you all the credit. They’re totally beautiful! I have never heard of watergate cake or salad. So I get a great recipe and a bit of an education! My hubs is a huge pistachio fan so he will love these! Watergate Cake has always been a favorite in our family since I was very young. I was actually going to make it for the holiday. Cupcakes are a great idea. Might just have to try them. 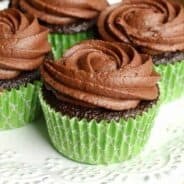 These cupcakes are wonderful, let me know if you try them!! Yup, I would have to get rid of those cupcakes too if they lived with me! So many awesome flavors going on in one amazing little treat! These cupcakes are so clever Aimee! I love anything that uses pistachio pudding and the pecans are the perfect touch! Have a great holiday weekend! I would bake cinnamon rolls. i would bake a carrot cake with lots of walnuts or pecans! These cupcakes look amazing. Definitely going to make these. I would love to make a homemade German chocolate cake with homemade frosting with lots of pecans! If I win, I will first bake a batch of Nutty Blondies. I would make the watergate cupcakes first! I would make some banana nut muffins if I win! I haven’t had a carrot cake in a while, so that is what I would bake up! 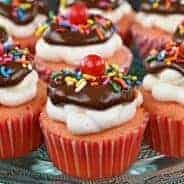 These cupcakes sound wonderful, I might have to make them over the holiday weekend! I will definitely be making these cupcakes this weekend. Thanks for a great recipe! 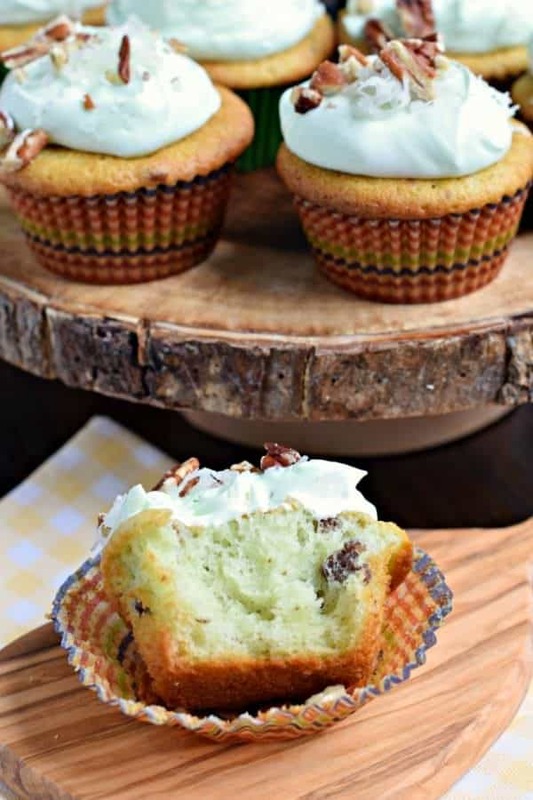 Whether I win or not , these Watergate Cupcakes are definitely first on my baking list … I love Watergate salad and these cupcakes look scrumptious. I was looking for a dessert to take for the 4th! THINK I FOUND IT!!! Definitely would have to try the Watergate cupcakes! I have been looking at Watergate cake recipes lately, and these are perfect! Definitely would try these first! Thanks! I would bake a coconut pineapple cake. Oh my! If I win the first thing I am baking is a double batch of these cupcakes because I know I will. love them. Pistachio anything is my weakness! Yum!! Have all the ingredients and will be making these as a surprise for Monday’s holiday. Thank you so much for the recipe! Those look absolutely delicious. I would definitely make pineaple upside down cupcakes with pecans. Topped with whipped cream and cherries. My precious Nana, who passed in May- would absolutely love these! I would first bake blueberry spelt muffins. So healthy and delicious! I would bake delicious mini pecan pie bites! I would make the Watergate cupcakes. They look and sound so delicious! I LOVE Watergate Salad! These Watergate Cupcakes look very tasty, and I love cupcakes with a bit of crunch! 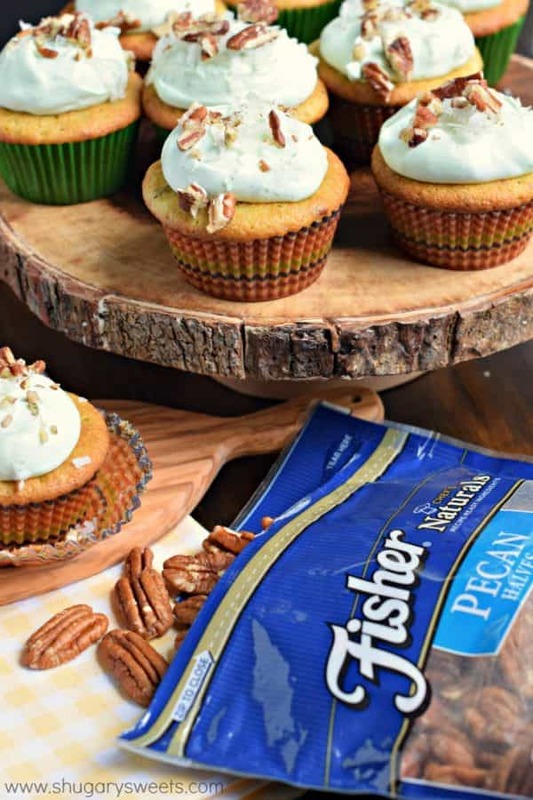 Fisher nuts are my go-to brand whenever I bake with nuts! These cupcakes sound awesome. Think I’ll try them! I would make some key lime cupcakes! If I win, I’ll be making these Watergate cupcakes first. They look awesome! I will be making these cupcakes! 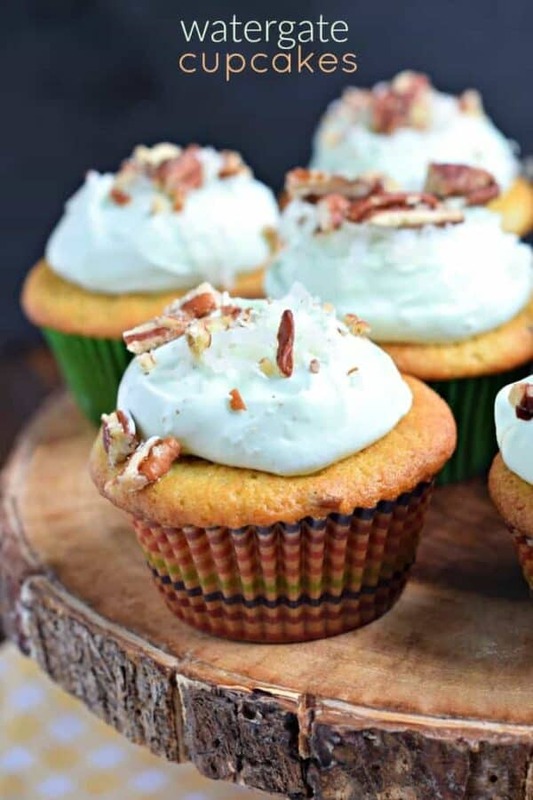 Love pistachio and cupcakes and pecans and frosting…. These cupcakes! They look SO good! I think I would make those yummy Peach Hand Pies that you posted earlier in the week! These cupcakes! Going to make them either way! I will bake pecan pie first. I would make the Peach Hand Pies….they look delicious!! Your Cupcakes sound so delicious! I would make my Maple Walnut Cupcakes that I make this time of year! I look forward to trying these Watergate cupcakes. They look so delicious and will stand out from the crowd! I am so looking forward to making and bringing them to an event. They will stand out from the crowd! I’d bake anything with pecans! I love anything with pistachio! I will have to try this beauties! I’ve never heard of watergate cake before looks amazing and will definitely try. I also love to add pecans to my peach cobbler and walnuts in my apple cobbler so I would love to win. I’ve never heard of these before! It sounds so yummy! Now, I want to make some! These look fantastic. Love all your recipes. What a good idea…to make Watergate salad into cupcakes!!! LOVE! Would bake anything with pecans! I will make apple pecan cupcakes for my niece’s birthday! These cupcakes look yum, would try this. I would make banana bread with walnuts. I would bake cupcakes for my grandson’s birthday. Brownies are the first thing I would make, followed by some pecan sandies. I am SO excited to see these! My dad always made us Watergate cake when he was alive. It was the best! These are just a smaller version. I will be making these very very soon! Thank you!! You’re welcome. I hope they bring back some wonderful memories for you! I’ll make banana nut muffins! I love Watergate Salad so I will try this first, or the next time I bake cupcakes even if I don’t win! I have tons of zucchini coming in ripe so I would make zucchini bread with nuts. I can’t wait to try this delicious sounding recipe ! These cupcakes are just perfect. I mean pistachio, pecan and coconut flavors in a CUPCAKE? I need that. Pinned! I would make a banana nut bread or zucchini bread. I would bake some banana nut bread first if I won because my kids and husband love it so much! I would make a carrot cake if I win and a pistachio cake or cupcakes!! I would make some pecan pie bars!!! I have never heard of this type of cake before. Sounds delicious! If I win, I would bake chocolate walnut cookies. Mixed Nut Brown Sugar Cookies would be first on the list! Thanks for your great post! I had no idea there’s such thing as Watergate cake. 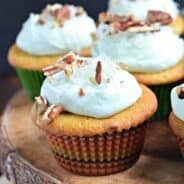 But, since I love pistachios, pecans and coconut I can totally see myself with zero will powder in front of these cupcakes, watergate named or not! Banana nut muffins would be a must. All time favorite. These look fantastic! Such pretty cupcakes! I would make these watergate cupcakes first. Im feeling like I seriously missed out on something amazing here! I love the sound of these nutty little treats – seems like they would be so up my ally! Dude, i could have eaten every single one.